At some point, every forklift – even the “old reliable” ones – must ride off into the sunset. Responsibly recycling your forklift is a smart way to get the best value for your investment. Unlike some assets, an old forklift cannot simply be set to the curb for the garbage truck to pick up. According to a recent article in Supply & Demand Chain Executive, there are certain things you can do to make sure your lift enjoys a smooth retirement – no matter your ultimate plans for the machine. How Do You Know When It’s Time to Retire a Used Forklift? First things first, it’s helpful to know when it is truly time to retire your old forklift and make the most of your money and efforts. There’s no standard formula to know it’s time to retire your lift, but you can look at the functional life versus economic life to get a good idea. Your forklift may still be chugging along, but that doesn’t mean it’s cost-effective to run it. If the cost of repairs for your forklift are becoming more frequent than you’d like and are cutting in on the profits you make using the forklift, the cost to run it is beginning to outweigh the value it provides. If you’re in this situation, it’s in your best interest to recycle your used forklift. The hours of operation of a forklift will help determine its economic life. This type of determination also includes how heavily it’s used, what condition it’s in, what conditions it’s used in, how well it’s been maintained, and more. When the hour meter of your forklift nears 10,000, you’ll want to start thinking about retiring your used forklift and finding a replacement. What Should You Do with an Old Forklift? Trade it in. If your lift still has some life left, try trading it in for a newer lift. Even if your lift isn’t worth using anymore, resourceful buyers can always use spare parts. Try a private listing or go with a third-party dealer. But just remember, the trade-in value of your used forklift drops as your maintenance costs rise, so if you’re wanting to trade it in, it is best to do so before your forklift fully depreciates. Sell it. Once again, if you want to sell your forklift and get something out of it, you’ll want to do so before your forklift has completely run itself down. This should ideally be before the 10,000-hour meter mark and before it requires major repairs. If you decide to sell your lift, you can put out an ad to sell it directly yourself, or you can list it with a third-party who can connect you with interested buyers. Reassign the lift for lighter duty. OK, so your used forklift can’t do what it once could. No problem – just move it to another part of your operation for less-stressful work. You could use it for small loads and other light-duty tasks. If you’re not yet ready to sell or trade it in, this is a good idea when you don’t want to run up your forklift’s heavy usage hours. However, if you get to the point when your forklift’s cost to run surpass the value of keeping it in use, you will want to either sell or trade it in. Scrap it. Depending on your local scrap market, it might be worthwhile to consider scrapping your used forklift. Some older models contain valuable metals, and these “hidden gems” can really pay off. 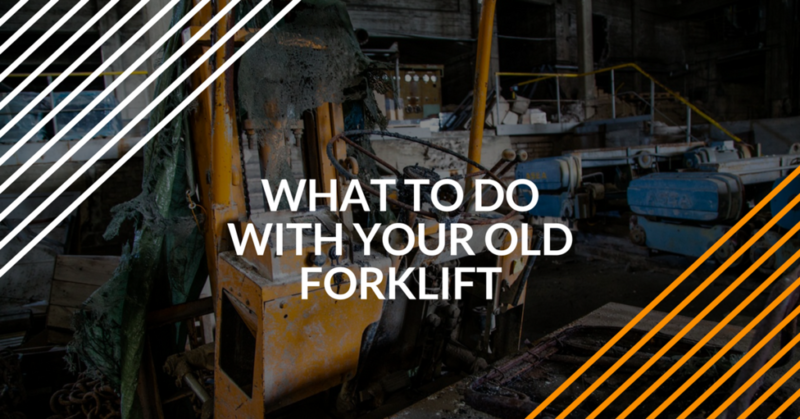 Do a little research on your particular lift to see if it’s scrap-worthy, looking for components like the make, model, and age of your lift in addition to the demand for your forklift’s scrap. Keep it. Hey, some of those old forklifts have sentimental value. Sometimes a tune-up or parts replacement can make all the difference. This is an option for older, well-maintained lifts. Even though it may not seem like a traditional solution for increasing your forklift’s life and making the most out of your investment, forklift training can help you or your employees operate your equipment in the most efficient and safe way possible. Understanding how to perform daily equipment inspections and knowing when any maintenance or repairs are needed is also covered in high-quality forklift training, which will certainly help you avoid serious repairs before they come up and keep your forklift running efficiently. You may find that making the investment into forklift training saves you money and loss of productivity over time. Forkliftcertification.com offers the best possible forklift training online, available in 3 convenient programs: the Forklift Training Kit, Train a Trainer class, and Bundle Training Package. Each class features OSHA-compliant training content, developed by a dedicated & professional staff. Our courses are made for busy workers and supervisors, just like you. Best of all, you can access our OSHA-ready training courses anytime, all the time. If you’re online, it’s easy to get your certification papers! But don’t take our word for it. Firms like Fuji Film, Verizon, Harley-Davidson and Coca-Cola rely on FLC for all of their forklift and OSHA training requirements. For more information, please visit our contact page or give us a call at (888) 278-8896. Every older, used forklift will retire at one point or another. Hopefully, this article will help you retire your forklift the smart, responsible way. Thanks for checking out the FLC blog!